MOB faculty members are drawn from several Departments in three Colleges (Arts & Sciences, Engineering and Medicine) at FSU, including Departments of Biological Science, Biomedical Sciences, Chemical & Biomedical Engineering, Chemistry & Biochemistry, Mathematics and Physics. Faculty research interests cover a wide range of areas from quantum and statistical mechanical modeling of biopolymers to biochemical and biophysical studies of development and gene expression to designing bioreactors to culture stem cells. Current areas of research strength include Structural Biology, Cellular and Molecular Biochemistry, and Computational Biophysics. You can find more information on the Faculty Research page. New graduate students in our program get off to a fast start by participating in Core Facilities Workshops during the couple of weeks before classes begin in the Fall. Students learn directly from the directors of the facilities about Protein Expression, Physical Biochemistry, X-Ray Crystallography and Computer Resources Facilities. Lessons include both theory and practical applications so use of the equipment will be in the student’s skill set. Students complete at least three 6 week rotations through labs of MOB faculty during their first year in residence. Following interviews with faculty of interest, students select at least three labs to investigate and usually complete a short project associated with the lab’s focus. There is time for a fourth rotation if the student chooses. This process helps the student and faculty members determine whether a particular lab is a good match for the student’s research goals. The 2014-2015 Rotation Schedule is available here. 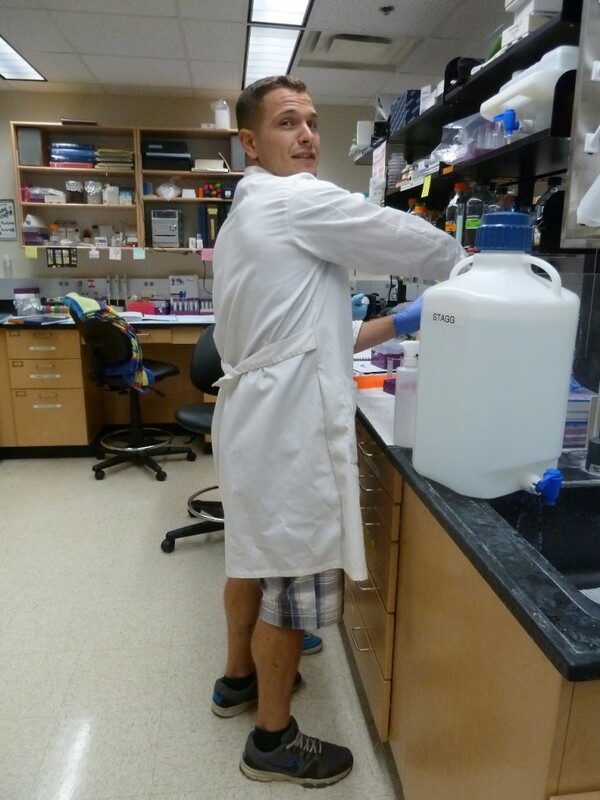 Once students have found a mentor at the end of their second semester, they typically spend their first summer semester getting their bearings in the lab they will call home. After completing their required courses, students are able to devote their attention to developing an innovative and noteworthy dissertation. Every Tuesday during Fall and Spring semesters, faculty and students attend the Structural Biology/Biochemistry Seminar Series held in the Kasha Laboratory Building. We are privileged to learn about the research of noted scientists from around the country and from FSU. Advanced MOB and Biochemistry students also present their research to their colleagues in this venue. Some of our guest speakers in the recent past have included Dr. Tom Pollard from Yale, Dr. Mina Bissell from the Lawrence Berkeley National Laboratory, Dr. Richard Kuhn of Purdue and National Academy member, Dr. Dinshaw Patel from Sloan Kettering. The MOB student group called SECS: Students for the Effective Communication of Science, holds a seminar & meeting once a week during the Fall and Spring terms to give MOB students the opportunity to speak in front of a group of fellow students about topics of current interest. Through questions and discussion in an open, but casual seminar setting, participating students learn how to become better lecturers and public speakers. 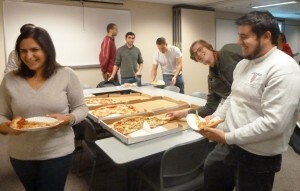 The MOB Program also provides the best pizza in town to fuel the sessions. 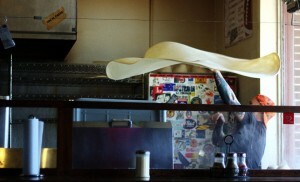 A Momo’s pizza in creation. Photo credit: Dr. Ilker Sen, 2006 MOB Graduate.